Two persons went missing from Karinkulam near Murickassery after chunks of earth and debris fell on top of their house in the landslide on Thursday morning. 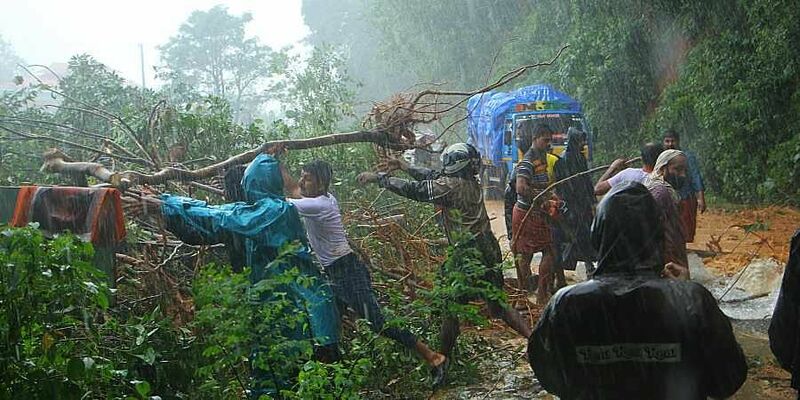 IDUKKI: Besides the five people who died in the landslide at Adimali, at least six people have been killed and more than 200 were forced to flee their homes after record rains pounded high ranges of Idukki on Thursday, triggering widespread flooding and deadly landslides. Two persons went missing from Karinkulam near Murickassery after chunks of earth and debris fell on top of their house in the landslide on Thursday morning, said District Disaster Management Authority (DDMA). The missing are Rajan and Usha of Karinkulam whose mother Meenakshi’s mutilated body was unearthed from the debris. Majority of the landslides were reported from the Devikulam taluk. In a landslip which occurred at Kurishukuthy near Kambilikkandam, Thankamma Mani of Panthappallil house was also killed. Five rescue camps have been opened in Idukki taluk. In total, 213 person have been rehabilitated. “Udumbanchola, Idukki and Devikulam are the worst affected taluks,” a DDMA officer said. Officers feared the death toll could rise as rescuers find it difficult to reach remote areas where telephone and transport links have remained cut. “Many of the victims belonged to the ethnic minority or tribal groups who live in makeshift structures along the forest ranges,” officials said.